This is a quick manual how to install the ModyPoly in an Korg Poly-61M. The existing midi sockets are used, so no new holes have to be drilled. Incomming midi messages are passed to both the original midi implementation and the ModyPoly. Outgoing midi messages will be from ModyPoly only. Install the ModyPoly as shown in the installation manual. Do not drill any holes for the midi sockets. Cut off the ModyPoly midi sockets. 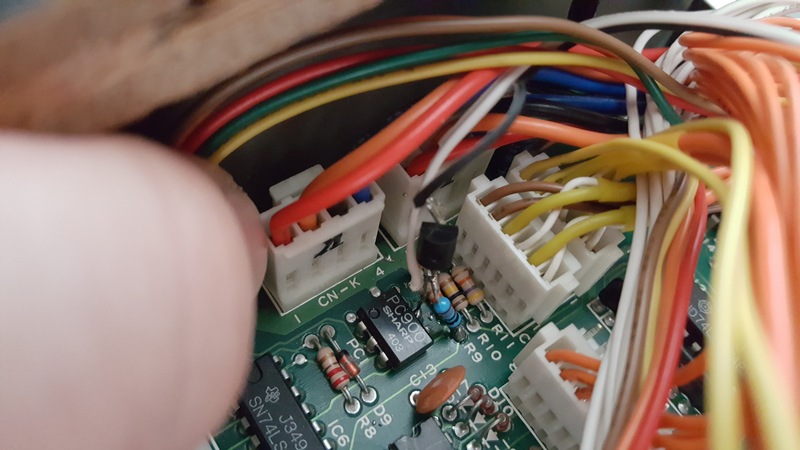 From the existing midi sockets, remove the red wire and solder the purple wire from ModyPoly in its place as shown in image 1 below. This takes care of the midi output. 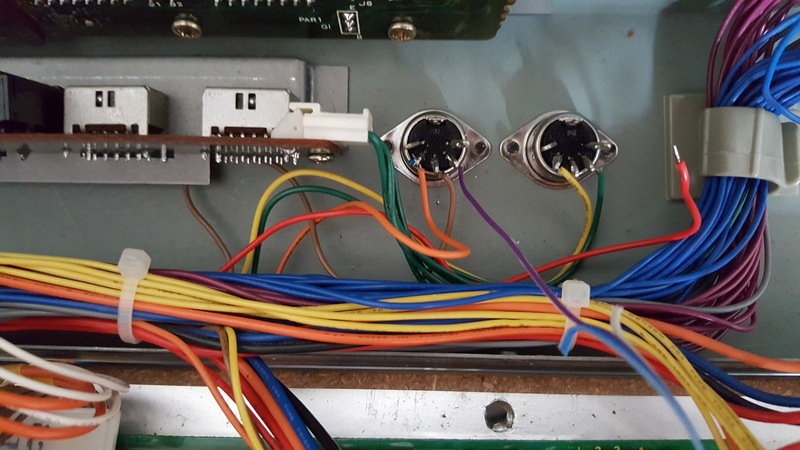 For the midi input you need the following additional parts: A NPN Transistor such as BC547C, a 100k resistor and a 470 Ohm resistor. 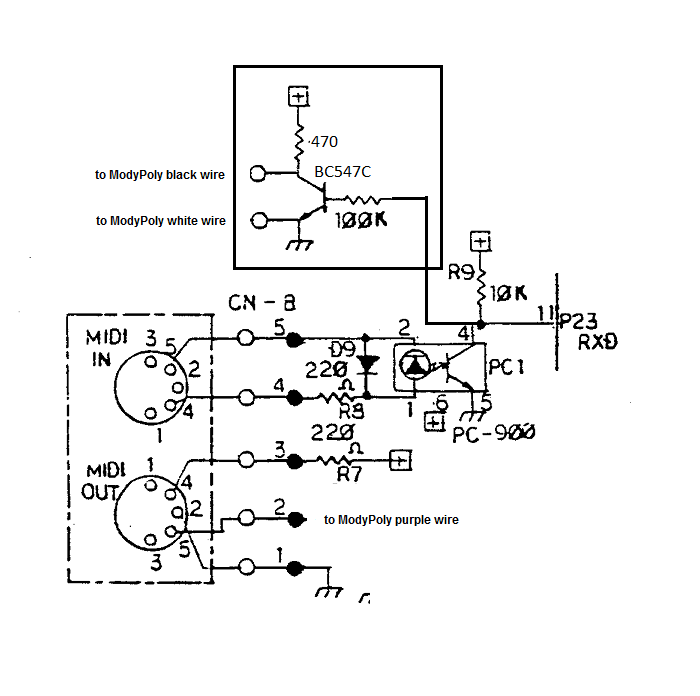 These parts need to be soldered to the PC-900 optocoupler found on the Poly-61 midi board as shown in schematic figure 2 and picture 3. Solder the black and white wires from ModyPoly to the points shown in the schematic. ModyPoly uses Program Change midi messages to switch Play modes, the Poly-61M uses them (correctly) to switch programs. So make sure you have the Poly-61M midi receive channel set to a different number then the ModyPoly midi receive channel. This entry was posted in Mods by tubbutec. Bookmark the permalink.